One of the most beautiful settings for a world class ski vacation or spending a summer vacation in the Utah's Mountains. nd skiing is spectacular either at Alta or the next door Snow Bird resorts.What a lovely setting facing the Alta Ski Resort and sitting right at the edge of the Road leading up to the Mountain, sitting at an elevation of 8000+ft! It is one of the greatest venues where you can book a private wedding and have all the guests stay at the lodge and enjoy once in a life time event. That's what memories are made of to last several generations. Nearby hikes in the Wasatch Mountains with stunning views and wild flowers in Alpine meadows are to die for. Though it is always nice to receive accolades, I believe you have mistaken the Rustler for another lodge here in Alta as we have not been open in the summertime for several years. In every other regard, your review is completely accurate! How many Five Star Reviews can you have? As many as you deserve. Lots of places rent rooms, very few do it as well as the Rustler. It's the staff they are the best. Smile on their face song in their heart, Love this place! 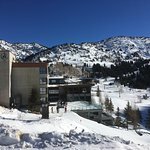 See you in Feb.
Four years ago, I wrote a review stating emphatically something I had known for years: The Rustler is unquestionably the best lodging experience to be had in Little Cottonwood Canyon. Well, it still is! 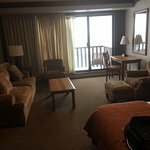 In fact, it offers the best lodging experience we ever have in the world of skiing — and we have skied in many, many places over the years. At first blush, the all-in price for a week at the Rustler may appear high, but once you assign a value to the incredible meals (breakfast and dinner) included in the price, it can qualify as bargain. I can’t speak for all the rooms, as there are a number of different types of rooms. However, if you don’t feel you have to have a “view” from your room, the Superior North rooms that we’ve stayed in on our last three visits are fantastic. They are large, beautifully furnished and, above all, exceedingly well lighted (a rarity in today’s hotels). Oh yes, the service at the Rustler is also impeccable. Finally, both Alta and Snowbird offer some of the world’s best skiing, but if, like us, you rather prefer Snowbird, no problem. You can easily ski both from the Rustler. If you don’t want to buy a combined ticket to ski from one to the other, the Rustler has a shuttle that will take you to Snowbird and pick you up at the end of the day.